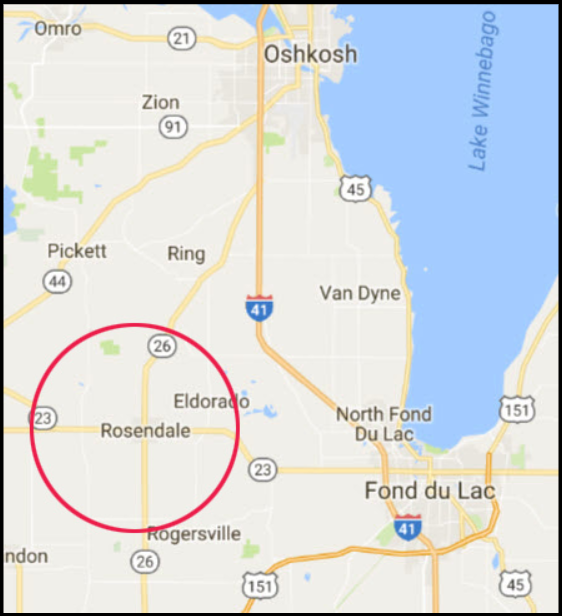 A tacit arrangement between the Wisconsin Department of Transportation and Rosendale, WI (pop. 1,063) has fueled the tiny village’s notoriety as a stereotypical speed trap town. Rosendale lives up to its reputation by handing out speeding convictions at a per capita rate of more than 50 times that of state capitol Madison. * Rosendale, 80 miles northwest of Milwaukee and situated along a popular route between Madison and Green Bay, is the motorist’s perfect storm. Wisconsin State Highways 23 and 26 intersect at the center of Rosendale. The speed limits of both highways drop from 55 to 45 to 30 mph in short order upon approach to the village. The changes in limits are posted but as the consistently high, year-over-year rate at which the village’s police chief and his five part-time officers write tickets indicates, that isn’t affecting driving habits much. Village officials cite safety as their primary concern when enforcing the lower limits. And it is true enough that some homes, schools and a church face the highways as each bisects Rosendale. But if handing out a slew of speeding tickets isn’t slowing drivers down and safety truly is the issue, why don’t WisDOT and Rosendale team up to find another solution to address traffic through town? Einstein’s definition of insanity – trying the same thing over and over and expecting different results – would seem to apply. More likely the village has grown dependent on ticket revenue. Rosendale points to the state when asked about adjusting the speed limits because WisDOT sets those criteria on state roads. When contacted by the NMA about the justification for the speed limits through town on the state roads, WisDOT noted that it reviews speed limits when requested by local officials or if there is a state highway project in the location. The agency suggested that we contact the local municipality if we wanted a review of the limits on State Highways 23 and 26. So without the blessing of the village, the state isn’t inclined to change the 30 mph limits of the state roads that flow through Rosendale or to build a bypass around the village to keep those incessant speeders from endangering residents. And Rosendale has shown no apparent interest in changing the status quo of collecting a little over $100,000 each year from speeding tickets. The perfect speed trap stalemate isn’t about to be broken anytime soon. Drivers are better served finding their own alternate routes around Rosendale rather than adding to the village’s coffers. * Rosendale handed out 4,512 speeding convictions over the three years ending in 2015. Madison, population 248,950, turned speeding citations into 18,800 convictions during the same period.